Chin like any other facial feature, should be proportionate to the rest of the face and more so to the nose. With ageing chin and jaw bone shrinks, making the problem worse. Small chin is often associate with double chin and fat under the chin and protruding lower lip. Chin should be neither too big nor too small. It should be proportionate to the nose and lower lip in profile as well as in front view. The groove between the chin and-and the lower lip should not be too deep. Jawline should be well defined, but angles of jaw should not be too prominent. Chin should be symmetrical. In men stronger chin adds character to the face and also offsets the effect of the very wide lower face. The attractive male jawline is strong and visible, with no under chin fat. Male chin is wider and more square than female chin. Juvederm: Juvederm voluma filler injections can be used to reinforce the bony structure of jawline and to increase the size of the chin. It can also be used to fill the groove between the lower lip and the chin. Chin and jawline implant surgery: Silicone implants can be placed over the bone through a small incision for enhancing the bone. Botox: Botox injections into platysma muscle of the neck help improve the jawline. Botox injection into the chin muscle help improve the shape and appearance of the chin and reduces the protrusion of lower lip and prominence of the groove between chin and the lip. Lipolytic injections: They can help dissolve fat under the chin. Viora RF Treatment: Skin tightening and under chin fat contouring can be done to improve the jawline. Liposuction: Under chin and lower face fat can be sucked out with syringe liposuction. Double chin surgery: This surgery is done through a small incision under the chin. Fat deep to muscles is removed, and muscles are repaired to create a good neck chin angle. Neck lift surgery: It is usually reserved for people in their forties and above. Neck muscles and skin are tightened to recreate the sharp jawline. Beautiful cheeks: A beautiful female face is triangular in front view, with a base at the cheekbones and tip at the point of the chin. Cheekbones are high, and there is no extreme hollowness or chubbiness of cheeks below the cheekbones. The lower face tapers to a pointed chin. Female cheeks are not excessively square. In men, the bony structure of cheekbones and jawline is stronger than in females. The lower face is more square, with prominent chiseled angles of the jaw. 1. 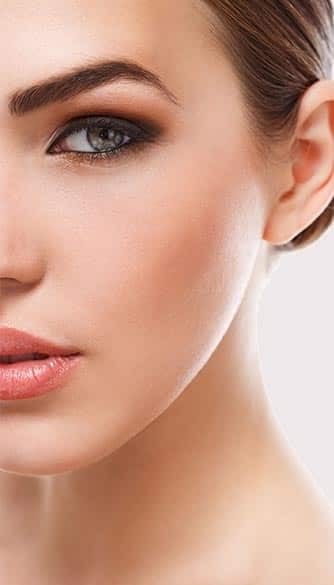 Juvederm: Juvederm voluma injections can give desired highlight to the cheekbones and restore the triangularity of the youthful and attractive face. Juvederm can be used to fill hollow cheeks. 2. Botox: At times the muscle at the angles of the jaw becomes too enlarged, making cheeks too wide in the lower part. This is called Masseteric hypertrophy, and Botox injections can treat this. 3. Malar Implant surgery: Silicone implants can be placed over cheekbones through the incision inside the mouth for augmenting cheek bones. 4. Buccal fat pad removal: Chubby cheeks where buccal fat pad is the cause, can be treated by this surgery. This surgery is done through an incision inside the cheeks. 5. Liposuction: Excessive fat under the cheek skin can be removed by syringe liposuction. 6. Dimple creation surgery: Permanent dimple can be created by this surgery. 7. Autologous fat injections: Fat can be drawn into syringes from one’s body and re-injected into cheeks to augment the cheeks. 1. What is the best treatment option for me to get beautiful cheek bones? implant, filler or fat injection? All these procedures are safe and effective. Juvederm has the minimum recovery time and maximum safety. Juvederm Voluma injection has no downtime and results are visible immediately. Results last up to 1.5 years. Fat injection is less reliable and is suitable for selected cases. 2. How is dimple created? Dimple surgery is done under local anaesthesia through an incision inside the mouth. Recovery time is two weeks. Yes, Botox is a very safe and proven medicine. It is the most popular cosmetic procedure in the world.